Ray is a participant at DSC and is very involved with the Prompting Theater Program. 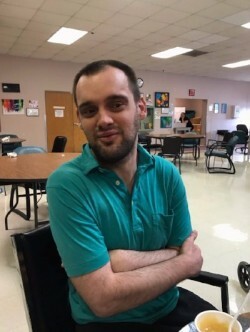 He was just recently a character in the Easter Seals 48-hour Film Challenge and he loved the scene where he was able to slam the door into another character’s face because it was something he wouldn’t normally do. One of Ray’s favorite memories was last spring when he got to drive a motorcycle outside in DSC’s parking lot, this is memory that he is hoping to recreate this year. He also has helped out by planning lunches out to his favorite restaurant, McDonald’s. When Ray is not at DSC riding motorcycles or helping with the Prompting Theater, Ray enjoys watching TV and researching how to become a Hollywood actor. Good Luck with your acting career Ray!